Security researchers discovered a new dangerous lockscreen threat knwon as the CainXPii virus that belongs to the same family as the infamous Hitler ransomware. Our complete removal guide shows victims how to eliminated the infection and recover their files. How Does CainXPii Ransomware Virus Infiltrate the System? The CainXPii Virus can be distributed using different strategies. We suspect that the captured samples so far present a testing version. This means that the current attack wave is relatively minor in comparison to a real campaign. Follow-up versions of the malware can utilize different spread tactics including some of the popular ones. Email spam messages use social engineering tricks to confuse the targets into infecting themselves with the CainXPii virus. The messages are crafted to look like notices and other important documents. The payload may be either attached directly or linked in the contents. In recent times malware such as the CainXPii ransomware virus are included in infected software installer bundles or office documents. The hackers include the virus code in them and once they are opened by the victims the danger is installed on the host systems. Virus delivery through scripts in some cases cannot be detected by ordinary anti-virus software. This is why we recommend that every computer user install and use a quality anti-spyware solution. The CainXPii ransomware can also be contacted from P2P networks like BitTorrent trackers where pirate content is usually distributed. The hackers also maintain their download sites that appear as legitimate sources. Direct hacker intrusion attempts are also possible. The criminal users target outdated software and break into computers if vulnerabilities are found. This is why we recommend that all users update their operating system and installed programs. Security researchers identified a new malware that appears to contain the same signatures as that of the infamous Hitler ransomware. At the moment the hacker or hacker collective behind it has developed only a testing version. Upon infection with CainXPii ransomware it automatically starts a lockscreen that displays a ransomware message in German. Instead of encrypting user and system data the creators of the virus have embedded a file delete function. If the victims close the application window the malicious engine starts to randomly delete files. 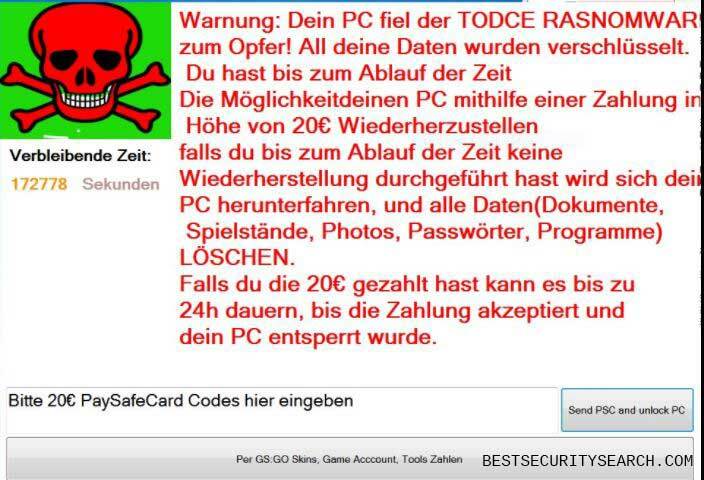 Warnung: Dein PC fiel der TODCE RASNOMWARE zup Opfer! All deine Daten wurden verschlusselt. The CainXPii ransomware note is standard and attempts to blackmail the victims into paying the sum of 20 Euro in the form of a PaySafeCard code. According to the note the CainXPii virus is able to encrypt sensitive information such as documents, multimedia files and etc. Instead of asking the victims to pay them the requested sum via a BiCoin transaction, the option here is the use of a PaySafeCard. WARNING! Manual removal of CainXPii virus requires being familiar with system files and registries. Removing important data accidentally can lead to permanent system damage. If you don’t feel comfortable with manual instructions, download a powerful anti-malware tool that will scan your system for malware and clean it safely for you. WARNING! All files and objects associated with CainXPii file virus should be removed from the infected PC before any data recovery attempts. Otherwise the virus may encrypt restored files. Furthermore, a backup of all encrypted files stored on external media is highly recommendable.